See Libby Hall. Doesn’t she look adorable in that T-shirt? Too bad that Libs doesn’t agree. 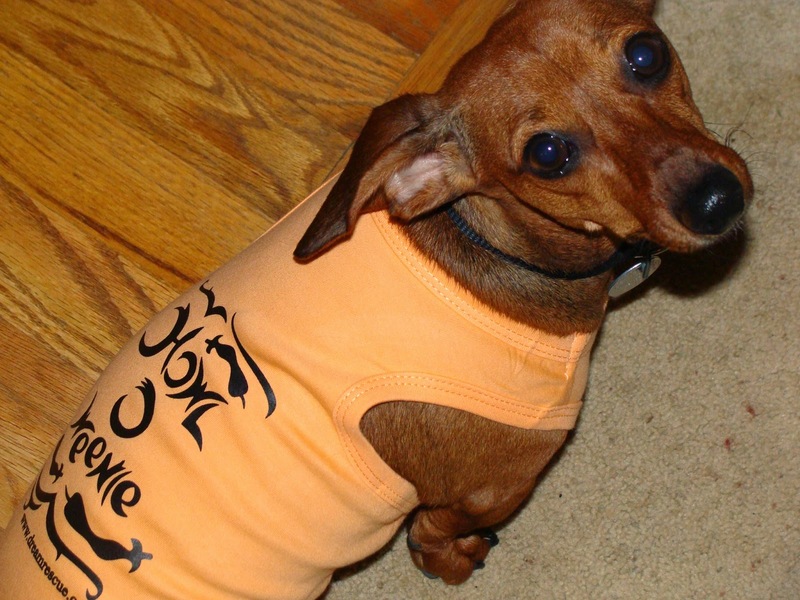 Libs is a short-haired, miniature dachshund who shivers, even in the house, now that it’s cold outside. (Okay, I recognize that cold in Georgia is nothing like cold in Minnesota. The point is, for Libby and me, it’s forty-two degrees and freezing.) And so I thought that her T-shirt would be just the thing to keep her warm and toasty. But Libs—after approximately three hours—wriggled out of her T-shirt. But here’s the amazing part: Now, Libs can wriggle out of that T-shirt in about ten minutes! Thanks to Libs, I realized that a manuscript I’d struggled with for three years had been useful. All the writing and work and revisions I’d put into that story helped me learn the finer points of crafting a middle grade novel. And now, I’m applying that knowledge to my latest manuscript. I still make mistakes, but I recognize them—and I know how to fix them. Lesson learned: Apply hard-earned knowledge to correct present writing problems. I keep a basket of Libby toys on a shelf, and the other day, I found a treat in that basket that I’d forgotten was there. I broke off half and gave it to Libs. Five minutes later, Libs was back under the basket, jumping up and begging for another treat. I ignored her. So she plopped down and whined in her little high-pitched puppy voice. And she whined. And whined. And whined. That dog is nothing if not persistent. And as you can probably guess, I finally gave in, tossing her the other half of the treat. I thought about several editors that had bought essays from me in the past. Libs prodded my memory about those markets, giving me a push to submit again. After all, if an editor bought once, she or he liked my style and voice. And eventually, all that whining—er, submitting is bound to pay off. Lesson learned: Once an editor has accepted your work, keep submitting. Speaking of treats, Libs is all about delicious little doggie morsels. She was not so much about taking her little doggie business outside. So we decided that we’d train her with treats, and it was quite the successful ploy. Even now, despite cold or wet conditions, which she definitely doesn’t like, Libs will dash outside and get ‘er done so that she can come back inside and get her treat. Goodness knows, writing is a tough business when it comes to tangible rewards. It can be years before a project pays off. So Libs reminded me that I need to treat myself for the little successes as well as the big successes. When I give myself a reward, I’m ever so excited to dash back to work. Lesson learned: A reward can be a great little motivator. So I suppose you can teach an old dog new tricks after all. But it helps to have a new dog like Libby Hall around (and plenty of treats)! That Libby Hall is quite the keeper of knowledge. She could take her show on the road. Very cute post! Hooray to our pets for teaching us life lessons! Great post---and we're on the same wavelength this week. Your lessons are my lessons, Master Y., and they are good ones to take to heart. You have the benefit of the cutie-pie Libby to offer inspiration, too! I don't know how you get anything done with that cute dog around! Persistence does pay off. I have a fat cat lap occupant who insists on being petted in the wee morning "writing" hours, but the rest of the day he does it his way: I shake the treat bag, and he runs to me; call him and he may or may not come to me or look my way. So I have to be persistent and pick him up. Libby is such a cutie. Lesson learned from my dogs--puppy dog eyes will get you absolutely anything you want. Think it would work on an agent/editor, too? It warmed my heart that you referenced good old Minnesota, where not only is it in the single digits, but it's due for another snow storm on Monday. But more importantly, it warmed my heart to be reminded that the work we put in now can make work down the road a little easier. So, we just have to keep at it. And all the Libby images? Definitely heartwarming!! Meet Flash Fiction Runner Up, Kelley Hicken!